President Barack Obama announced emergency measures Monday to ease the impact of the worst drought in half a century, but stopped short of waiving the government’s requirement that a large portion of the now-shriveled corn crop be diverted to make ethanol. Obama announced that the Department of Agriculture will buy up to $170 million of pork, lamb, chicken and catfish to help support farmers suffering from the drought. The food purchases will go toward "food nutrition assistance" programs, like food banks. During a campaign stop in Iowa, a key battleground state, Obama blamed Republican vice presidential candidate Paul Ryan for blocking a farm bill that could help voters in Iowa and elsewhere cope with a crippling drought as both candidates campaigned in the important Midwestern battleground state. "If you happen to see Congressman Ryan, tell him how important this farm bill is to Iowa and our rural communities," Obama said in Council Bluffs, Iowa. 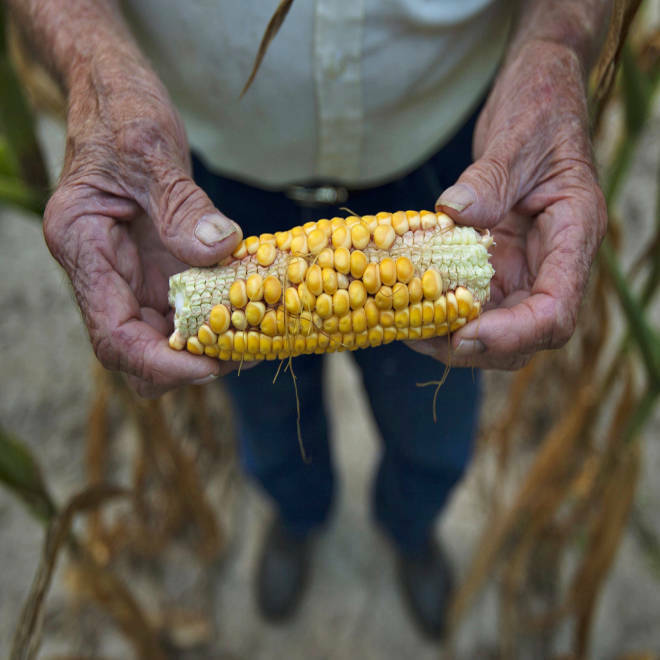 On Friday, the government confirmed what cattle ranchers, pork farmers and poultry producers have feared as this summer’s deepening drought has destroyed much of this year's corn crop. President Obama addresses a grassroots event in Iowa and discusses the impact of the recent drought on farmers. He encourages Congress to pass the Farm Bill and make it into law. As the lowest yields in nearly two decades squeeze feed supplies, livestock producers are asking the government to waive a five-year-old requirement that gasoline sold in the U.S. contain roughly 9 percent ethanol. Because most ethanol in the U.S. is made from corn, roughly 40 percent of the corn crop, in a good year, is purchased by the biofuel industry. "We do support the American ethanol industry," said Kristina Butts, executive director of legislative affairs at the National Cattlemen's Beef Association. "All we are asking for is that competition for that bushel of corn be on a level playing field." The government, she said, "is picking the ethanol industry to be the winner to get that bushel of corn." With the rest of the world’s food chain already strained, the competition for each kernel of corn is going global. Last week, a United Nations food index jumped 6 percent, and the UN's Food and Agriculture Organization warned against the kind of export bans, tariffs and buying binges that worsened the price surge four years ago. The U.N. food agency stepped up the pressure on the U.S. to ease its biofuel policies. Leaders of the Group of 20 nations are considering whether to seek emergency measures to respond to soaring grain prices. The White House faces conflicting demands for sharply limited supplies of corn. One-third of House members have signed a letter urging EPA Administrator Lisa Jackson to relax ethanol production targets in light of corn supply concerns and spiking prices. The governors of Maryland and Delaware, two poultry-producing states, have also called on the White House to ease the renewable fuels mandate. Ethanol producers, meanwhile, argue that they're being unfairly blamed for the supply pressures faced by livestock producers. They argue that critics overstate the industry’s impact on supplies of feed because about a third of the corn that's processed to make ethanol is then converted into a form of animal feed called dried distillers grain. A prolonged interruption in ethanol production could produce a spike in the price of gasoline, according to Tom Kloza, publisher of the Oil Price Information Service.